Rodney Leer, Brenham Independent School District, USA "Not only does the internet feel faster, but CACHEBOX allowed me to better understand our network traffic"
Cody Ridennoure, Rocky Ford School District R 2, USA "I'm really impressed with the CACHEBOX, really. I've setup Squid by hand, so I know how much clever work has gone into the product..."
By serving web pages to your users from a local web cache, you need to fetch less data from the internet, saving you bandwidth and money. 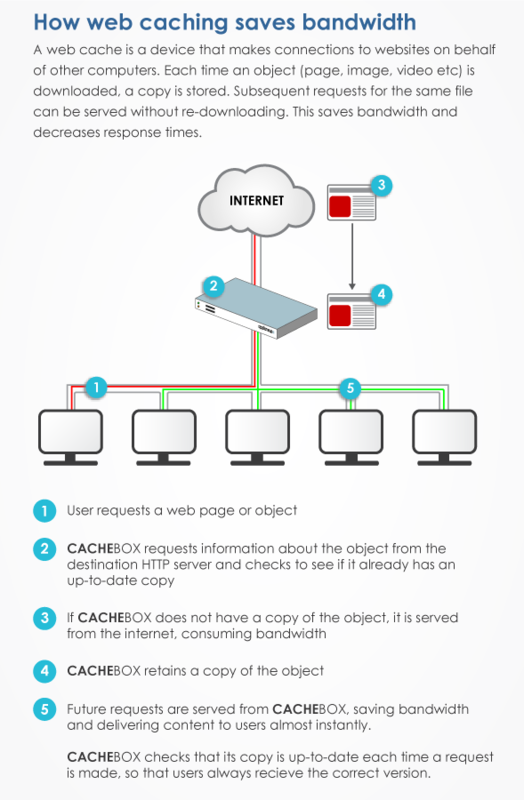 With intelligent caches like CACHEBOX, this applies to the images, video and software updates which account for the majority of today’s internet traffic – and the majority of headaches for network managers. The amount of bandwidth saved by caching varies depending on the context. Most organisations see savings of 20-40%, depending on the mix of traffic in their network. Getting more out of your existing bandwidth – and the money saved as a result – is the #1 driver for using a cache in many cases. A simple Return on Investment calculation demonstrates a payback in months, making it a “no-brainer”.